Revised January 1, 2010, all other versions are obsolete. For the purposes of these Terms & Conditions, the Ronald T. Dodge Co. will be referred to, as “Dodge” and the Buyer, Customer, Client, User and/or Recipient of Dodge’s products and/or services will be represented as the “Buyer”. All of Dodge’s products and/or services are prepared on a best effort basis and are based upon a reasonable, obvious process that we feel we can perform based upon the information that the Buyer provides. Dodge examines each project on a case-by-case basis. All of Dodge’s products and/or services are considered to be an engineering trial and made on an experimental basis, unless otherwise specified and submitted in writing by Dodge. Laboratory, pilot scale-up and production quantities will be determined by Dodge’s capacity and batch sizes. Quantities may vary depending on the project and specifications set forth as well as uncontrollable losses. Any material furnished by the Buyer or its constituents needs to be accompanied by a Material Safety Data Sheet (MSDS) and Technical Data Sheet. The material needs to be supplied in a form ready for use. 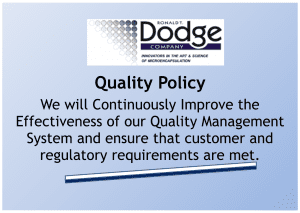 Dodge has no liability for any material due to its loss or alteration resulting from the microencapsulation process. Dodge expressly limits its liability regarding Buyer-supplied core materials (in Dodge’s possession or in Dodge transit) to the amount of the value added that is generated by the microencapsulation product and/or service performed by Dodge for the order in question. This value limit is referenced in the quotation and/or price sheet. Wall Materials will depend on the core material as well as the application in which the microcapsules will be used. Dodge generally furnishes processing aids for use during the microencapsulation process. Capsule size will vary depending on the core material as well as the application in which the capsules will be used. The products and/or services are supplied as they come from our equipment. Dodge does not represent the products and/or services prepared under this order as being suitable for consumer use in food, pharmaceuticals or cosmetics, unless otherwise specified in writing by Dodge. Any material supplied by the Buyer, will be considered abandoned material after ninety (90) days of its receipt by Dodge, unless otherwise stated in writing by the Buyer and agreed to by Dodge. There may be storage fees accessed to any abandoned material, and Dodge reserves the right to return the material to the Buyer at Buyers expense or dispose of the material in a way that Dodge deems fit. All information and data supplied by Dodge is considered accurate but is furnished upon the express condition that the person/persons receiving it will make his/her/their own assessment to determine the products and/or services suitability for his/her/their particular use. No warranty is expressed or implied regarding such other information, upon which the data is based, or the results to be obtained from the use thereof, that any products and/or services shall be merchantable or fit for any particular purpose, or that the use of such other information or products and/or services will not infringe any patent. The Buyer must furnish a written purchase order referencing this policy and/or a signed quotation before Dodge will begin work. Dodge will only accept all orders in the form of a written Order of Acceptance. Payment is to be made by either Cash In Advance (CIA) or Cash on Delivery (COD). Credit may be extended at Dodge’s discretion. The products and/or services will be invoiced at time of shipment. Dodge’s products and/or services may be experimental with no guarantee of their success. By accepting this price sheet and/or quotation, you have accepted the responsibility to pay the price based on the work performed by Dodge and not on the Buyer’s interpretation of the order being a success. Upon commencement of work on the products and/or services, the Buyer is obligated for the entire value of the order. Dodge reserves the right to terminate the performance of work under this order in whole or in part at any time, by written notice. Upon receipt of such notice, as compensation to us, the Buyer agrees to pay the percentage of the total order price corresponding to the proportion of the amount of work completed on the date of termination to the total work. This is our full compensation for the work completed under this order. Prices are as stated on the price sheet and/or quotation referencing this document. Pricing is calculated on, but not limited to, the Buyer’s specifications, complexity of the microencapsulation process, hazardous and/or sensitive core materials, laboratory, pilot and production quantities, acquisition and/or modification of core material, as well as formulating the microcapsules into their final product. Shipping, handling, documentation, customs fees and taxes are not included in the pricing. To the extent requested by the Buyer, such costs will be separately stated in our invoice and will be paid by the Buyer unless otherwise stated on the price sheet and/or quotation. Terms of the sale are net 30 days from the date of the invoice, unless stated otherwise by Dodge in writing. A 1% or $25.00 per month (which ever one is more) will be applied to any unpaid bill, or part of, until the bill is paid in full. If the Buyer’s financial responsibility becomes unsatisfactory, Dodge, at its discretion, may elect to withhold or postpone further shipments of goods to the Buyer until such buyer’s financial responsibility has been established to Dodge’s satisfaction. Dodge also reserves the right to require CIA or COD payments for future orders. F.O.B. Plant, Dayton, Ohio, unless otherwise specified in writing and accepted by both Dodge and the Buyer. Normally, allow 15 working days from Dodge’s receipt of all the core/raw materials, to complete an order. For expedited orders that may disrupt Dodge’s normal flow of work, an additional 10% per day per order may be added to the price. For international shipments, outside the continental United States, Dodge requests that the Buyer provide Dodge with their preferred carrier and account number and bear responsibility for compliance with all export and duty laws. Additional charges maybe added to cover export packaging and documentation. Dodge will make every reasonable effort to ship by the date requested, but Dodge is not responsible for delays beyond our reasonable control. If this is an engineering trial, the Buyer accepts the responsibility of inspections and testing of all goods as they relate/perform in the Buyer’s application. For engineering trials Dodge will not accept any returns or adjustments after the delivery of the products and/or services. In the event Buyer believes the goods do not meet the desired specifications of this order, Buyer must contact Dodge in writing within seven (7) days of receipt of the goods detailing Buyer’s concern. The Buyer’s payment for, and/or the receipt of the order does not include the conveyance of rights to any of Dodge’s proprietary processes, procedures, inventions, technologies and/or intellectual property. If not already covered by a signed confidential disclosure agreement, the Buyer agrees to keep confidential as proprietary, all information, including designs, drawings, specifications and data, furnished by or prepared by Dodge specifically in connection with this product and/or service, and the Buyer agrees not to divulge or use such information. The Buyer agrees to indemnify and hold harmless Dodge, its successors and assigns of Dodge’s business, assets or products, against all suits at law or in equity and all loss, liability and damage, including costs and expenses, resulting from any claim that the experimental usage, manufacturing, use sale or resale of any goods supplied under this order, infringe any patent or patent rights, or other claim of proprietary rights, and Buyer will, when notified, defend any action or claim of such infringement at Buyer’s own expense. The Buyer agrees to indemnify and hold harmless Dodge from and against all suits at law or in equity and from all damages, claims and demands arising out of the death or injury of any person or damage to any property alleged to have resulted from the goods hereby ordered, and/or resulting from any of Buyer’s acts or omissions, or those of Buyer’s agents or employees, and, upon the tendering of any suit or claim to you, Buyer agrees to defend the same at Buyer’s expense as to all costs, fees and damages. The foregoing indemnification will apply whether Buyer or Dodge defends such suit or claims and whether the death, injury or property damage is caused by our sole or concurrent negligence or otherwise. The Buyer will carry adequate insurance to cover any of such recited claims against Dodge. Dodge shall be excused from performing any of our obligations under this Agreement, Order and/or its products and/or services that are prevented or delayed by an occurrence not within our control. The Buyer agrees that since Dodge does not know of and/or have any control over your use of the products and/or services supplied under this order, and in order to spread the overall risk, Dodge makes no warranties expressed or implied, with the respect to the products and/or services supplied hereunder which are furnished on an “As Is” basis. Dodge makes no warranties regarding the fitness for any purpose or of merchantability and no warranty that the use of information or products supplied will not infringe any patent. The Buyer exclusive remedy and the limit of Dodge’s liability for any and all losses, injuries, and/or damages resulting from the use of or incorporation of our products and/or services into your product shall reflex only that value added by Dodge’s products and/or services as stated on the price sheet or quotation. Under no circumstances shall Dodge be liable for any direct, special or consequential damages suffered by Buyer or as a result of the use of the products and/or services supplied by Dodge. Dodge does not make any warranty regarding the fitness of its products and/or services for the Buyer’s customer or any other use in the Buyer’s product and/or equipment. The laws of the State of Ohio, USA, will govern all questions concerning the validity and operation of this order and the performance of the obligations on the parties under this order. If this copy of the above Terms and Conditions is not legible please access a copy on Dodge’s website at www.rtdodge.com/termsandconditions or call 937-439-4497 and request a copy via facsimile.